Homepage. 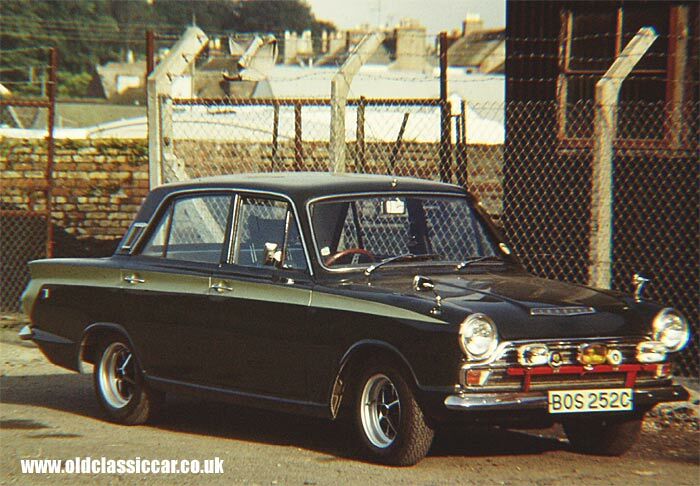 This page: A colour photograph of a sporty 1965 Cortina Mk1 (reg BOS 252C) back in the sixties. JD has sent over a number of photos showing cars he has owned, including the photo above, of a '65 4 door Mk1 Cortina GT finished in green, with a contrasting side flash. It certainly looks well, on period Rostyle wheels, with a wood/drilled aluminium steering wheel, various extra lamps and chrome mirrors too. The small badge fitted to the rear wing is the original Ford 'GT' badge. The Mk1 Ford Cortina, or Consul Cortina as it was first known, made its debut in 1962, initially available in two door form only. The Cortina GT arrived in April of 1963, offering extra grunt to the family motorist who liked to press on a little, without the extra cost and complexity involved with buying, and maintaining, a Lotus-engined Cortina, which made its first appearance in the dealerships at the beginning of '63. The GT's engine was a 1498cc four cylinder, first seen in the Consul Capri GT. Two and four door versions were available. A combination of a raised compression ratio, bigger exhaust valves, a revised camshaft, carburation courtesy of a single Weber carb and a four branch exhaust manifold, endowed this sporting saloon car with 78bhp. 'Heplex' pistons were also used in the Cortina GTs. Front disc brakes were fitted, as was uprated suspension to cope with the extra performance that this modified engine provided. The interior was more befitting of a performance model too, with a useful remote gearchange, and extra gauges fitted in a new centre console. Good original GTs are hard to find now - I don't know what happened to JD's car but chances are it is no longer around. Interestingly, the GTs had a heavier duty bodyshell (as found on export Cortinas) than the base UK-market models. If you're in the market for a Mk1 Cortina GT, I found this handy site, that gives advice on how to spot a real GT, handy as the spec of all Cortinas, including the GT, evolved throughout the Mk1s production run. Many standard cars were also 'improved' by enthusiast owners over the years, making it more important than ever to be able to spot a real GT (or Lotus-Cortina) from the fakes.